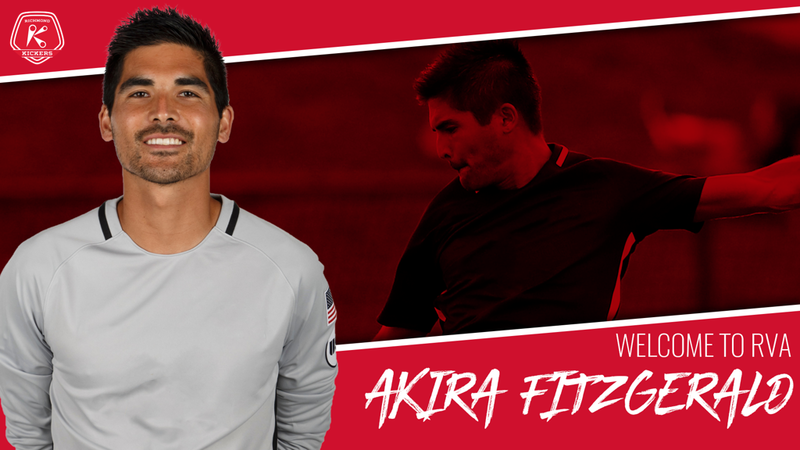 RICHMOND, Va. – (Wednesday, February 6, 2019) – The Richmond Kickers are pleased to announce the signing of goalkeeper Akira Fitzgerald for the 2019 season, pending USSF and USL League One approval. Most recently, Fitzgerald has spent the last two seasons with USL Championship side Tampa Bay Rowdies. He notched 25 saves and recorded four clean sheets in 13 appearances with the Rowdies. Over two different stints with North Carolina FC, Fitzgerald made 82 appearances for the club, making 406 saves. Fitzgerald earned a contract with Major League Soccer expansion side New York City FC in 2015 in between his time with North Carolina FC. Spending four years at Wake Forest University, Fitzgerald made 73 appearances with the Demon Deacons, picking up honors such as being named Second Team All-ACC his senior season and was one of 30 candidates for the 2010 Lowe's Senior CLASS Award for men's soccer after an ACC-leading 81 save season. During his Junior and Senior seasons, he recorded 12 appearances with the Cary Clarets of USL League Two. “I have long admired Akira from his days at Wake Forest when I coached against him,” added Matt Spear, Kickers President. “Wake plays an attractive, successful brand of soccer, and Akira’s style of play and ambition suits our Kickers’ aims too. Having an experienced, savvy, verbal leader in the back like Akira is a huge ingredient for our recipe. And Akira fits our culture off the field too as he’s others oriented with a shared aspirations approach." The Richmond Kickers are now at nine players with the signing of Fitzgerald, including Amass Amankona, Matt Bolduc, Dennis Chin, Josh Hughes, Eli Lockaby, Mutaya Mwape, Scott Thomsen, and Braeden Troyer. Don’t miss a moment of the inaugural 2019 USL League One season at City Stadium! Place your deposit now for 2019 Richmond Kickers Season Tickets and receive perks throughout the season including VIP Express Lane at the Craft Beer trucks and merchandise discounts. More details on 2019 Season Tickets can be found at RichmondKickers.com.